Predates the formation of Nevada and Arizona. An iconic map of the American west and one of the rarest and most desirable of all Colton atlas maps. This is an extraordinary example of the first edition first state of Colton's 1855 map of the territories of New Mexico and Utah. This is one of the rarest and most desirable of all Colton atlas maps. Based on earlier wall map produced by Colton and D. Griffing Johnson, this map details the regions between the California and Texas and between Oregon and Mexico. Covers territorial New Mexico and Utah including the modern day states of Nevada, Colorado, and Arizona. Colton identifies a number of important emigrant and exploratory routes including Fremont's, Kearney's and the Spanish Trail from New Mexico to Los Angeles. Also shows three of the routes proposed for the Pacific Railroad. The Beswith route runs across the north of the map passing just south of Great Salt Lake. In the middle of the map the Gunnison Route is shown, as well as the site, near Lake Sevier, where Captain Gunnison was killed by the Ute Indians. Across the bottom of the map, the Parke route, which precipitated the Gadsden Purchase, is also noted. Colton identifies Fillmore City as the capital of the Utah Territory and Santa Fe as the capital of New Mexico. This map further identifies various forts, rivers, mountain passes, fords, and an assortment of additional topographical detail. Map is hand colored in pink, green, yellow and blue pastels to define territory and state boundaries. Surrounded by Colton's typical spiral motif border. Dated and copyrighted to J. H. Colton, 1855. Published from Colton's 172 William Street Office in New York City. Issued as page no. 51 in volume 1 of the first edition of George Washington Colton's 1855 Atlas of the World. Rumsey 0149.056 (1856 edition). Phillips (Atlases) 816. Wheat, C. I., Mapping the Transmississippi West 1540 - 1861, 832, frontis. 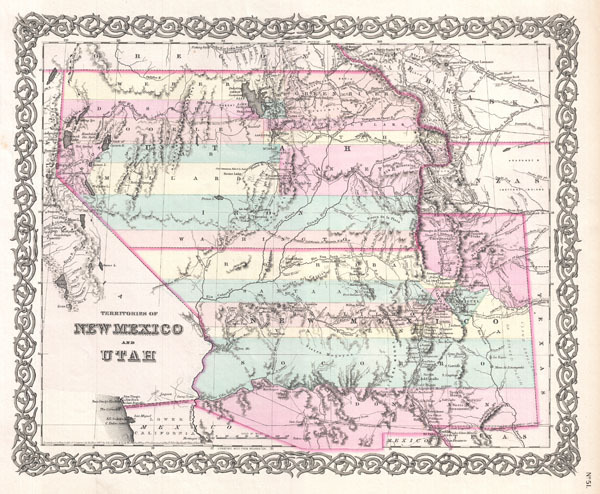 Brown, Wesley, J. H. Colton's Territories of New Mexico and Utah, state 1.